Today I would like to do a comprehensive review of one of my favourite tools and a tool that I am using everyday. Its called NimbleCRM and in my role as BDM here at Crucial it is a lifesaver. Most sales people need to keep abreast of all changes in their in their industry, movements of key people within their industry and also the movements and updates of all their customers and potential leads. This is a really big task if not done efficiently. LinkedIn has helped sales people keep updated and I am a heavy user of LinkedIn constantly viewing it throughout the business day and contributing regularly with content into LinkedIn discussion Groups. Nimble is completely web based so you dont even need to download anything. But with so many contacts, discussion groups and updates sometimes big things can slip through. For example, is one of your key clients changing roles? if you didn’t have an easy way of doing this you could easily miss a crucial update like that. That’s where NimbleCRM steps in, it tracks everything. You plugin all your social accounts, Facebook, Twitter, LinkedIn and Google+ and Nimble constantly tracks the updates, changes to all your contacts and prepares them to you in one single easy to read feed. This makes it so much easier to keep track of everything. Whats some of the main features? This tool will search for other social profiles that are owned by your contact. This means that say you are connected with someone on LinkedIn but you are not connected via Twitter. This will let you link their LinkedIn account with their twitter account and you will be able to follow not only what they say on LinkedIn but also what they tweet on Twitter. This is a really easy to use function and I find it so useful! Sometimes people wont update little short snippets on LinkedIn that they will share on twitter. This can give you the edge when you are speaking with a potential client. Another really useful task is the ability to remind you to stay in contact with people. You can set reminders inside nimble to prompt you to stay in touch with your contacts. This is a really useful sales feature in that you can keep your clients in close contact. There are also some great ways to extend Nimble using tools such as Zapier . Zapier allows you to connect all the dots with all the different services you use. As anyone who reads our blog knows we are all huge evernote fans! Zapier lets me sync nimble and evernote and lets me create new notes, tags etc from Nimble to Evernote and vice versa. Really great stuff and a perfect time saver. Andrew, appreciate this thorough and thoughtful review of Nimble! Many thanks for including us on the blog. Do you use Nimble as the full CRM solution for your company, or are you using it primarily as a tool for your personal network? If you do use something else like Salesforce.com, how do you use the 2 together? 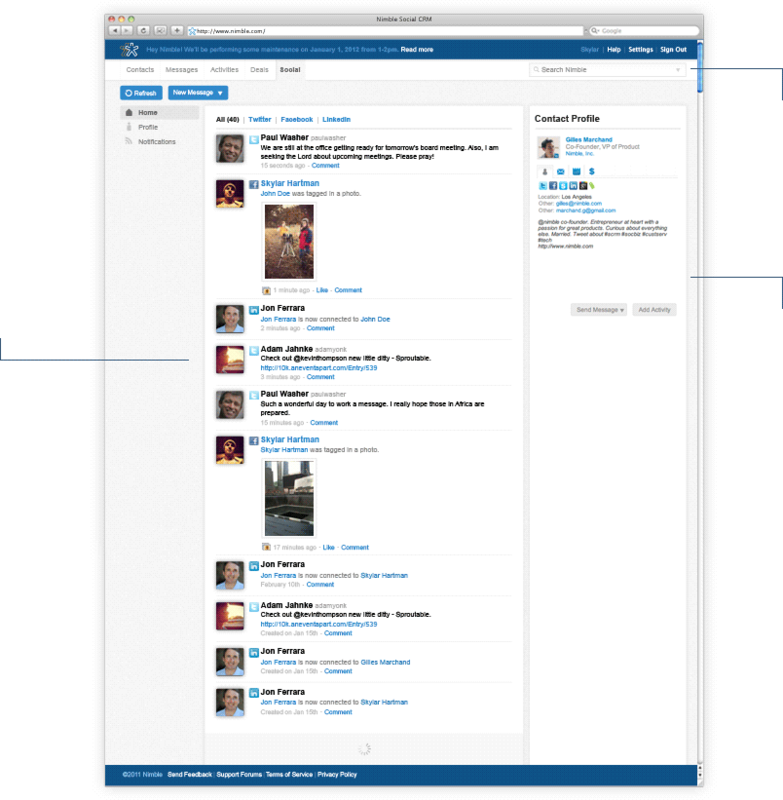 Thank you for sharing how you use Nimble in your daily professional workflow. You captured many of the key use cases Nimble was designed for in a short simple post. Did you know we have a WordPress plug in that imports leads from a WordPress site? I think it’d be an ideal combo for your Crucial Cloud Hosting business customers. Hi Jeff, Thanks for your question. I was using Zoho CRM and we did look at Salesforce but the added functionality didn’t really justify the cost . 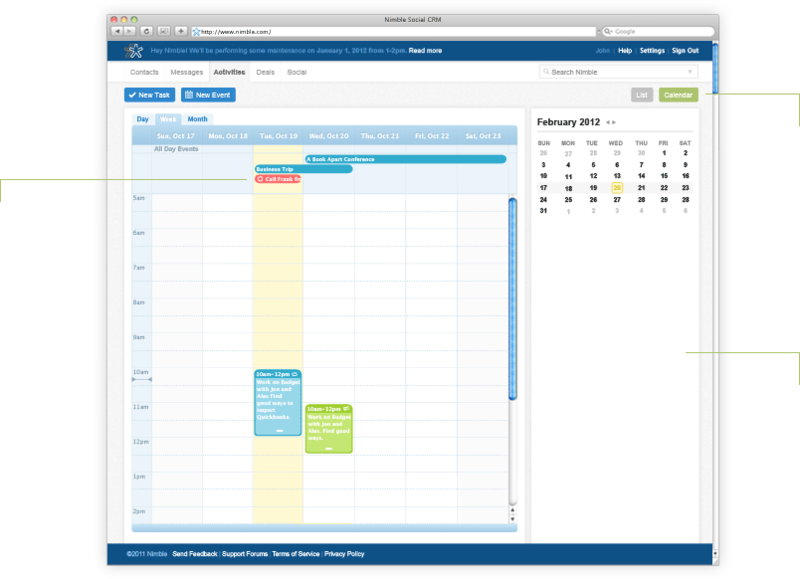 But when I found Nimble it actually did all the things we needed it for so we decided to use Nimble for our sales crm. Our customers are very social so interacting with them via these channels has proved very successful. I cannot think of any easier way to keep track of large databases of contacts and be able to react very quickly. When looking for a sales crm, I did a large amount of research on social selling and closed loop selling. Nimble ticked all the boxes for us. What tools are you currently using John?